After the release of the popular Oculus Rift, many consumers wanted to be a part of the virtual reality gaming world without having to break the bank. While there are plenty of alternative VR headsets such as the well-known Google Cardboard, there are headsets that offer a bit more in terms of function, look, and feel for a little extra cash. In our VR Shinecon review, we’re going to take a look at the headset’s specs, pros and cons as we decide whether this is a worthy device for VR games. It has an ergonomic design with a fully adjustable T-shaped strap and cutout for the nose to help you breathe comfortably. The full 360-degree viewing technology allows for gaming and watching 3D movies. It’s compatible with any Android or IOS phone (iPhone 6 and up) with a 4 to 6-inch screen size, including LG, Sony, HTC, Asus, Samsung, and more. The soft leather protector cushions your face and dissipates heat so it doesn’t fog up the lenses. The Fresnel lenses have an adequate focal length to eliminate constant manual adjustments. It has adjustable pupil and focal distance for the best immersive VR experience. It works with apps such as Google player, YouTube, Veer, etc., and with over 500 VR apps. The headset is rather versatile since it’s compatible with any modern smartphone. The materials used to make the headset are environment-friendly, resistant to high temperatures, and highly durable. You can use it anywhere comfortably for private viewing experiences, which is ideal for movies, videos, and VR games. You won’t have any burning or irritating side effects on your face or eyes since the VR Shinecon is equipped with radiation protection. It won’t heat up your phone and the quality lenses prevent visual fatigue or nausea. They don’t fit glasses wider than 5 inches very well, which may make for a disappointing viewing experience if you really need them to see. The headset doesn’t have a toggle button for interacting with the apps. You have to have a Bluetooth controller to do so. There are no instructions included, just two QR codes that lead you to the VR Shinecon website and an APK app to install. The physical manual reads in mostly Chinese, which is inconvenient if you’re trying to troubleshoot or figure out the proper VR apps to play. Our VR Shinecon review starts with the design of the headset which is rather simple for it’s just a plastic headset with leather covered padding and an adjustable strap. Although, it’s comfortable to wear since it won’t heat up your phone which can cause the headset to heat up your face. The T-shaped strap balances stress in four force points to reduce pressure around the eyes up to 30%, alleviating any irritation and fatigue. On the top of the headset is an easily accessible button you can turn to adjust the pupil and focal distance. While the VR Shinecon is ultimately durable and won’t break easily if accidentally dropped or bumped into something, it’s a bit inconvenient being that there isn’t a button to interact with the apps like the Google Cardboard has. You’ll have to purchase a separate Bluetooth controller if you wish to use the headset to its fullest capabilities. The headset’s lenses aren’t as high quality as the Oculus Rift’s, but they still hold up pretty well. Although, if you depend on glasses to see clearly, your viewing experience may not be very enjoyable since the VR Shinecon can’t fit glasses more than 5 inches wide. Also, when it comes to the spring loaded phone holder, it seems that it barely squeezes in phones even with a thin case on. Some might be wary of inserting their phone without a case on, but it tends to fit better. Thanks to the control wheels on the top and side of the VR Shinecon, you can easily calibrate your viewing experience. The pupil adjustment accommodates for the distance between your eyes while the object adjustment increases or decreases how near your phone is depending on if you’re far-sighted or near-sighted. If you have Myopia (near-sightedness), the VR Shinecon compensates well up to six degrees and can support most visually impaired users. Although, for anyone over this number, it may be best to use contacts instead of glasses since they don’t tend to fit well inside the headset. The VR experience itself, whether you’re playing games, watching a movie, or watching some YouTube videos, is actually pretty decent. The lens have a slightly lacking field of view but they don’t make you nauseous or dizzy and are more reliable than the Google Cardboard. It’s important to keep aware of your surroundings though since the headset doesn’t have any sensors of its own. Because the headset doesn’t come with built-in headphones or speakers, the sound quality mostly depends on the headphones you choose to use. You can easily connect your headphones to your phone without the sound being affected, and if you wish to play without worrying about your wires tangling, it’s recommended you use wireless headphones. Overall, if you have good headphones, then the sound should be of excellent quality. 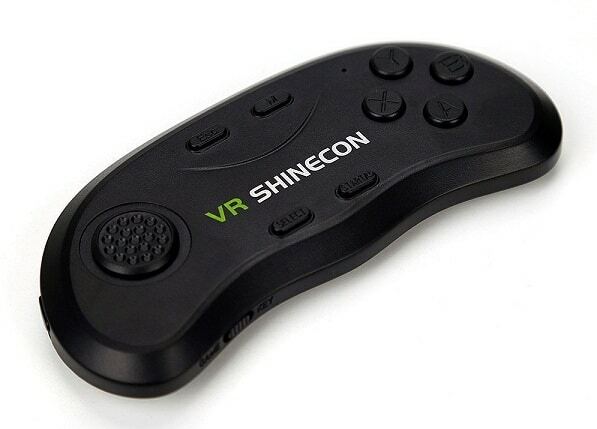 The VR Shinecon’s biggest drawback is that it doesn’t have any “action” buttons or screen tap buttons, and it doesn’t even come with an additional gamepad. You’ll have to buy a separate Bluetooth gamepad in order to navigate through apps and have more of a variety of VR games. You can use any gamepad that’s compatible with your phone whether you have an Android or an iPhone. As we wrap up our VR Shinecon review, we think it’s worth the extra dollars above the Google Cardboard, but if you have the budget for it, you may want to consider a headset in the more expensive and high-quality range. The design is comfortable to wear and has adjustable pupil and object knobs for a better VR experience. Once you get past the setup, this headset could prove to be enjoyable, especially considering its economic price and features. 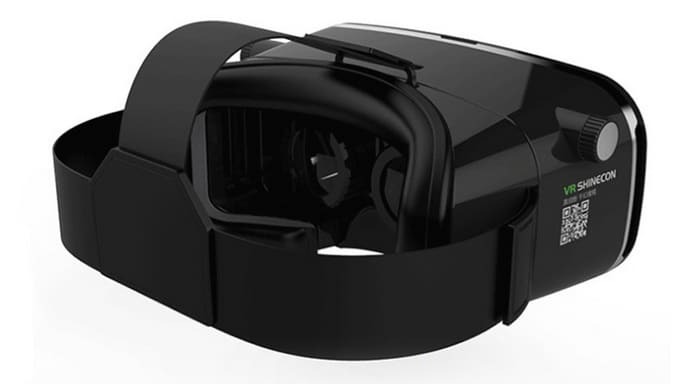 EVO VR Review – Is This Extremely Cheap Headset Any Good?